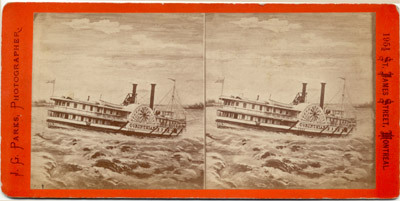 Stereoview of the Richelieu and Ontario Navigation Company steamboat CORINTHIAN in the rapids of the Saint Lawrence River. Probably the Lachine Rapids. View predates 20 September 1892 when the CORINTHIAN burned in the Cedar Rapids of the Saint Lawrence River. According to the Montreal Photographers, 1840-1950 site, Parks operated from address on the inscription from 1875-1882.